Command Sergeant Major John R. VanNatta The March 2006 recipient of the Distinguished Hoosier Award, John R. VanNatta, was recently recognized for his service to the United States Military at a ceremony at Bagram Air Force Base in Afghanistan. Command Sergeant Major VanNatta has served as the Director of Detainee Operations in Afghanistan for over two years. His responsibilities include oversight and development of doctrine and training programs to train the Afghanistan Army in prison and detention operations. His efforts lead to the remodeling of several prisons and the training of selected Afghan soldiers and their leaders in prison management and detention operations. His work resulted in the creation of a highly trained military unit capable of operating prisons that meet internationally accepted standards. This unit is recognized as a model for prison operations in Afghanistan and elsewhere. 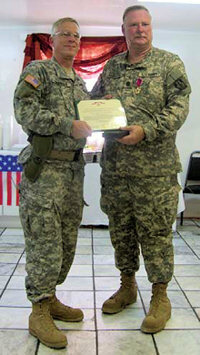 On July 28, 2008 U.S. military leaders flew into Bagram Air Base, Afghanistan and presented the Legion of Merit medal (description below) to John VanNatta. Participating in the ceremony were Major General James Hasbargen (photo right), Commander Army Reserve Medical Command, Major General William Monk III, Commander 99th Regional Readiness Command, Major General Randy Mosley, Montana Adjutant General, and Brigadier General James Payne, former Commander 300th Military Police Brigade. Also present were soldiers from the Active Army, Army Reserve, and National Guard representing the many soldiers Command Sergeant Major VanNatta lead over thirty-three years of military service. Command Sergeant Major VanNatta has a long tradition of service to the country. His father Ralph M. VanNatta was a veteran of both World War I and World War II. His brother Ralph W. VanNatta of Shelbyville, Indiana, is a combat veteran of the Korean War, and his brother Royal served in combat in Vietnam. John's sister Jacquie and his daughter Windy served in the Air Force, and his son Austin was in the Army. John enlisted in the Army at age seventeen and by his eighteenth birthday had been promoted to Sergeant and received his first combat patch. His military service spanned over thirty-three years. He held numerous key positions around the world. In 2002-2003 he was the Superintendent of the terrorist detention facility at Guantanamo Bay, Cuba. There he designed supervised construction of several state-of-art facilities, namely Camp Delta, to house and maintain over 680 terrorists from forty-four different countries. CSM VanNatta was personally requested by name to visit Iraq twice to consult on prison operations there. Following this tour of duty the Secretary of Defense awarded VanNatta the Defense Superior Service Medal. 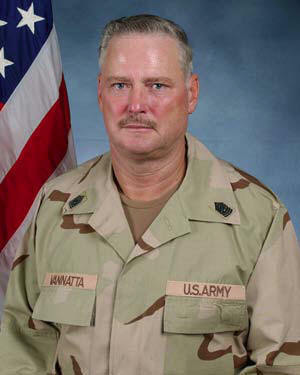 John VanNatta's civilian career is equally impressive. He started in education teaching at the high school level and taught at the university level in Indiana. He entered law enforcement in Edinburg, Texas, and was promoted up through the ranks. He started his career with the Indiana Department of Corrections as the Assistant Chief of Internal Affairs. He served in various key leadership positions and earned both his Masters and Doctorate degrees in prison operations. He served as superintendent for several prisons in Indiana, most recently as the superintendent of one of Indiana's largest prisons located in Miami County, Indiana. In 1979 Mr. VanNatta was presented the Governors Commendation by then Governor Otis Bowen. In 1991 he received the state wide Employee of the Month award from former Governor Evan Bayh, and then in March 2006 Mr. VanNatta was presented the Distinguished Hoosier Award by Governor Mitch Daniels for his exceptional service to the state of Indiana and the Department of Corrections. Currently Mr. VanNatta is still servicing our country overseas in the War on Terror. He is with MPRI serving in Afghanistan. Mr. VanNatta is the Director of Detainee Operations for the United State Government in Afghanistan. In his current role he works directly with the United States Military, Department of Defense, and Department of State, and with the Afghanistan Ministry of Defense and Ministry of Justice and the Afghan military. He designed and implemented an extensive training program for the Afghan military in prison operations that enables them to operate prisons that met international standards. Their operation is now the benchmark for all prisons both military and civilian in the country. Mr. VanNatta intends to return to Indiana when this mission for the government is completed. This Distinguished Hoosier hopes to continue to serve the citizens of Indiana while enjoying Indiana countryside. The Legion of Merit (photo left) is one of the United States military's most prestigious awards. It is one of only three United States decorations to be issued as a neck award (worn around the neck), or worn pinned. The others are the Congressional Medal of Honor and the Presidents Medal of Freedom. It is awarded for exceptionally outstanding service in performance of meritorious service to the United States. The performance must merit recognition by individuals in a key position which was performed in a clearly exceptional manner. The Legion of Merit is worn after the Defense Superior Service Medal and before the Distinguished Flying Cross.